THE Bishop and Bishop’s Council have altered their timetable to decide on potential parish reorganisation – because of the huge amount of feedback they have received. 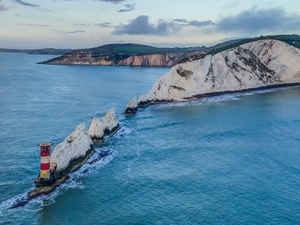 Our Bishop’s Council was due to consider the possible reorganisation of parishes in Havant, Gosport and the Isle of Wight at their meeting last night (Dec 5). But Bishop Christopher suggested that members needed more time to consider the responses they’ve received via public meetings, their visits to PCCs, emails and petitions. 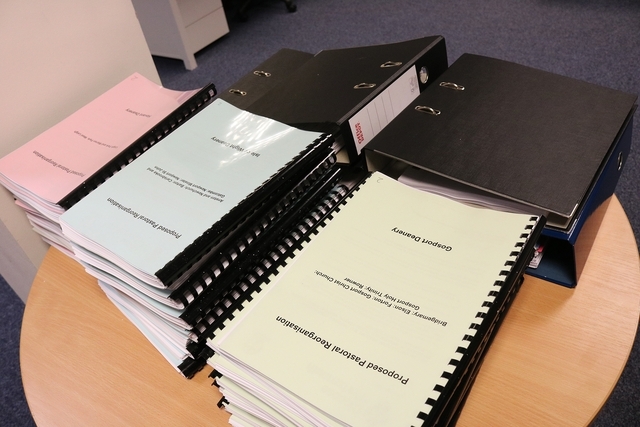 Their final visits to individual parishes only happened on November 30, giving them little time to read through all the responses before their meeting (pictured above: copies of the paperwork Bishop's Council members were sent). Many members of the Bishop’s Council had approached the meeting feeling the same as the bishop. Members therefore warmly welcomed the bishop’s suggestion and voted unanimously to delay making any further decisions until the New Year, in order to read through all of those responses and to take them seriously. Bishop Christopher told the meeting: “We are an apostolic Church – one holy, catholic and apostolic, as weekly we proclaim. So we are sent out with the good news. Of course we welcome people in and invite them to come to our community and to our church buildings, but our vocation is also to be sent. “These consultations are about changing our structures to help both that invitation to come in and also our calling to go out. They are about a mixed economy church; about the familiar that we know and have, and initiatives that we do not yet take. to rejuvenate engagement in new ways, not just doing more of the same. “Our responsibility - mine and yours - is to attempt as much as we can to draw others into friendship with Jesus. We have been trying very hard to grow members of our congregations in confident faith so that each of us can play our part in making contacts and disciples. “We have also in this diocese learned and seen that we can do other things as well, taking initiatives to make a difference. That is why Bishop’s Council has since March been moving towards a decision we soon need to make about turnaround ministry in some parts of the diocese, enabling both existing and new ministry to flourish. “As Christ’s Church in this diocese we are called to be faithful to the faith we have received and to share it afresh in each generation. That responsibility and privilege requires our commitment and our vision. 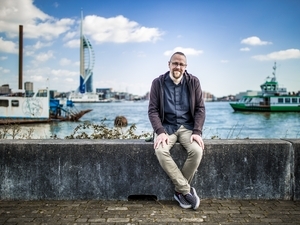 The original proposal was to invest £9.1m over the next five years into parishes in Portsmouth, Havant, Gosport and the Isle of Wight to help the Church of England reach more people with the gospel. More than half this money could come from the national Church. The proposal has since expanded to become a £9.65m project. It is part of the diocese’s live | pray | serve strategy which aims to make new disciples, to grow our church communities, to equip worshippers for lifelong learning, and to help to transform our society. The proposal could involve reorganising parishes in Leigh Park, Warren Park and West Leigh, parts of Gosport, and in Newport on the Isle of Wight to help the Church engage with the local community in new ways, using learning from existing programmes in our own parishes and projects from other dioceses..
As well as three public meetings at the start of the consultation process, Bishop’s Council members have attended 30 meetings with individual PCCs and groups of clergy in the affected areas over the past six weeks. Hundreds of emails and many letters have also been received, as well as petitions. Every single response has been sent to every member of Bishop’s Council to consider. The Bishop’s Council will now meet in January to consider the proposed reorganisation further. If they agree draft proposals then, there will be an eight-week period of formal consultation throughout February and March. And a special meeting of Bishop’s Council dedicated to these proposals will be organised in April. If they are agreed then, there is a further consultation process with the Church Commissioners, following which a decision will be made. The original proposal involved the creation of teams of clergy and lay people who could work in new ways to engage with local communities. This could involve the creation of multiple new congregations, new pioneer ministers, and work to revamp our church buildings. The idea was that the project would be funded by £3.75m in reallocation of existing resources, up to £1m from diocesan reserves, and £4.9m from the national Church. The diocese is applying for this £4.9m from the Church Commissioners as part of their national Renewal and Reform programme. The bid to the national Church has now been split into two parts. We’ll hear by Christmas whether we’ve secured funding for the first part – money which could be spent to create infrastructure for new church plants and new pioneer ministers in Portsmouth.